This beautiful hanging heart shaped decoration is the perfect gift for Mum. It is white in colour with floral decoration scattered around it. 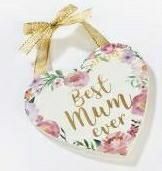 In the centre it reads the words "Best mum ever" in gold font. Attached to the top is a piece of gold ribbon making it ideal to hang.